Allow all types of leave and absence management (paid leave, reduced working time, seniority leave, unpaid leave, sick leave, etc…) in days worked, working days, calendar days and hours. Provide the employee with real-time visibility on their leave entitlement. Enable the employee to submit a paperless leave request according to rights earned. Give the possibility to manage overtime and overtime recovery hours. Provide each employee with total visibility of their team members’ absence schedule. Allow the manager to approve (or reject) leave requests in the system. Enable the payroll administrator to extract a leave entitlement report for all employees at any time for any period. Notify each party by e-mail as soon as new event occurs (submission and processing). Time saved when submitting requests : no more paper forms to fill out, no need to send leave requests to the manager and then reminders (immediate notification upon request approval). Risk of error is eliminated : the employee cannot submit a request for leave they are not entitled to. Decision support : visibility of the absence schedule (leave and business travel), visibility of remaining leave rights. Time saved at the monthly closing : no more paper forms to cross-check and consolidate, the complete report is generated in one click and directly available in Excel, no more filing to do. Risk of error is eliminated : the system itself consolidates the data which can easily be exported to Excel, there is no longer any error due to manual input. Time saved informing employees : fewer employee requests as they have direct real-time access to their balance. Trial the leave management module now! My Intranet, HR portal for paid leave management, allows different types of leave to be efficiently managed. Thanks to the schedule available for each employee, the module allows you to take care of part-time employees. With this fully configurable module, you will simplify HR management of administrative tasks. And by opting for SaaS mode, the HR department will not have to worry about the technical maintenance of this HR software. On this page, the employee accesses the different information they need to follow up on their leave. They can also submit a new request via the leave request form. The leave management module administrator can use this page, with each employee profile, to add or delete leave requests for each employee. The leave entitlement status table gives the calculation for each type of leave. It provides a quick view of the leave days earned, days requested, days taken and the balance, including the intended period for each type of leave. The calculations for this table are made dynamically everytime the page is updated. It is crucial to notice that this table will only show the types of leave which the employee is entitled to according to their category. The table with the leave and absence records gives the different leave requests submitted as well as their status. The employee can then delete the requests assuming their starting date is in the future. The overtime recovery hour table gives all the overtime hour declarations. Finally, you can submit your leave request by selecting the starting date and the end date (if different from the starting date), select leave type and then submit the request. If there is a sufficient balance available, the request will be taken into account and submitted for validation to the manager (or in the event of their absence, the person with delegated authority). 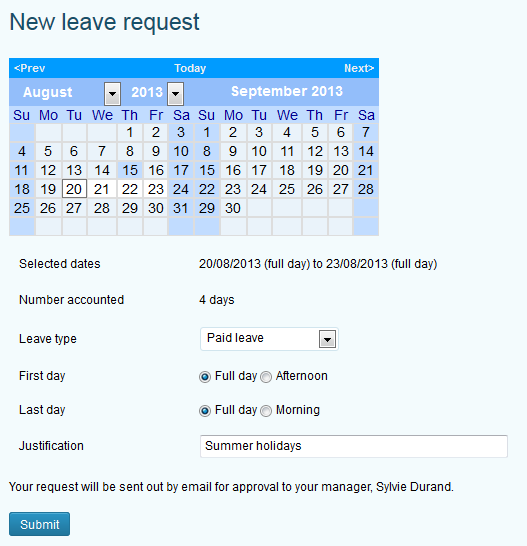 This easy to use leave request form allows to submit a new leave request in just 3 clicks. On this page, the employee can also manage the time savings account and credit days during periods defined by the Human Resources department. For the time and attendance management, depending on the configuration, either the employee declares their overtime directly or the HR centralize performs individual declarations on behalf of employees. To do that, you simply have to fill out the form by indicating the date with the starting hour of a typical day, the usual ending hour and the actual ending hour of that day. The program automatically calculates the difference between the usual ending hour and the actual ending hour to determine the employee’s number of overtime hours. On this page, supervisors can approve or reject leave requests submitted by their team members. If on leave themselves, a manager can delegate another company employee to validate leave requests submitted by their team members. A table lists all leave requests pending validation. For each request, the manager can mention the reasons for their decision. 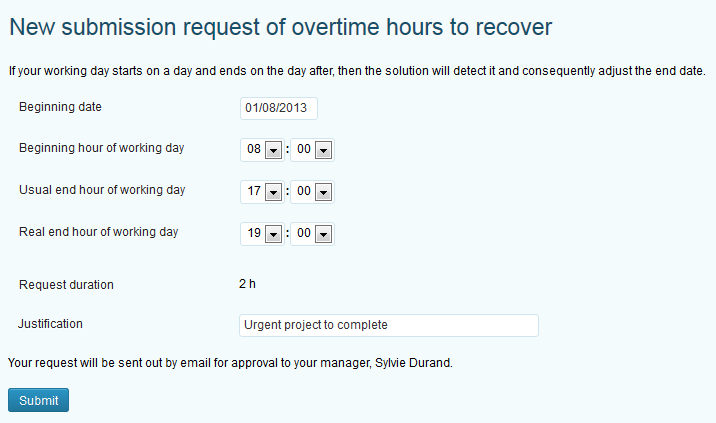 On this page the manager also validates overtime hours declared by their team members. A table indicating the leave balance available to be taken by each team member. A schedule enabling them to see who is present and who is absent over a given period according to planned leave and travel. Thus any arbitrage can be settled very quickly. The leave schedule is accessible to all workforce. It can be sorted by date, employee category, location and team. It is useful to schedule project planning. The HR manager (or any other person entitled to administrate the leave module) can generate an absence report at any point for any period of time. It is possible to filter the report per employee category, per location, per team and per employee. To facilitate human resources management, the person in charge can also export this report in an XML format file, immediately usable in Excel (or any other spreadsheet software compatible with the XML format). As a result, the data is consolidated and can be easily used for payroll processing. If payroll management is outsourced, the HR department can share this file with the accounting firm in charge of payroll processing. This reporting is very useful in administrative management of employees. It allows the personnel management department to monitor absenteeism and save time thanks to the dematerialization of this HR process.